Here is a photograph taken on Easter Sunday 2016 at the event outside the GPO in Dublin which commemorated the 1916 Easter Rising. An officer from the Irish Army read out the text of the famous Proclamation of the Irish Republic, which was published by the rebels on the first day of the Rising. 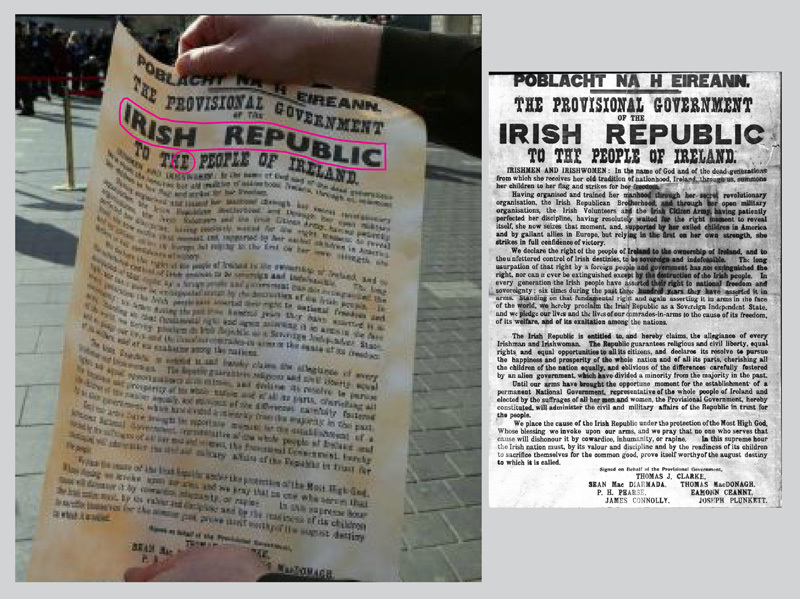 The document which the officer is holding purports to show a copy of the 1916 Proclamation, but it is in fact a later retouched and ‘faked-up’ version. It is the same image which was discussed by the type historian James Mosley in a 2010 blogpost. 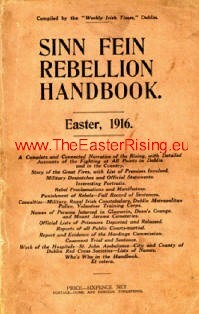 Mosley’s essay meticulously dissects the various versions of the Proclamation which have appeared over the 100 years since the original was printed in Dublin on the eve of the Easter Rising, and is essential reading for anyone interested in how the image has come to play such an important role in the iconography of the Irish rebellion. Mosley’s essay uses a scan of the real Proclamation from the copy held in the Providence Public Library, Rhode Island, USA. I have placed this side by side with the Army’s version above, and have highlighted the two most prominent differences between the typesetting which show that that it is a later ‘fake’. There are several more points which indicate that the item above uses a later version of the Proclamation. Some of these are difficult to see in low resolution but I have highlighted another which is fairly obvious. This is the letter E which appears as the fifth letter of the fifth line, in the word ‘THE’. The men who typeset the Proclamation gave several accounts of their work, and famously told of how they ran out of type for the capital E letter. This one was therefore converted from a capital F with a judiciously placed piece of sealing wax. The blob of wax can be seen clearly above in the ‘original’ on the right, which is compared with the ‘fake’ on the left. Quite when the ‘fake’ shown above was perpetrated is difficult to tell. Mosley demonstrates that it originates in a book called The Sinn Fein Rebellion Handbook, published by the Weekly Irish Times in May 1916, and reprinted several times shortly afterwards. This contains a ‘copy’ of the Proclamation, which was made from a photographically reproduced line block. This, as would have been the custom in the printing trade at the time, was extensively retouched. The cleaning up of the capital E was amongst the work done then. 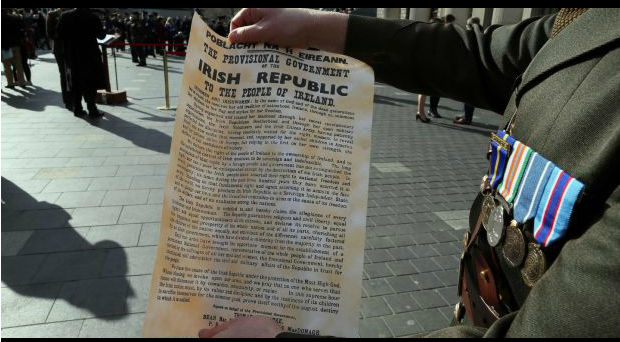 Although this retouched reproduction is almost contemporary with the Easter Rising, it is not an exact copy of the actual Proclamation. This has not deterred many people from claiming it is, as can be seen in the many images which can be found all over the internet. It is quite difficult for the lay person to tell the difference between this version and the original. However, the later ‘improvement’ which uses the Gill Sans Extra Bold reset headline is very easy to spot. Quite when (or why) it was done is not certain but it is likely to have been sometime in the 1950s or 1960s. It appears on a range of souvenirs, some of which can be seen below. 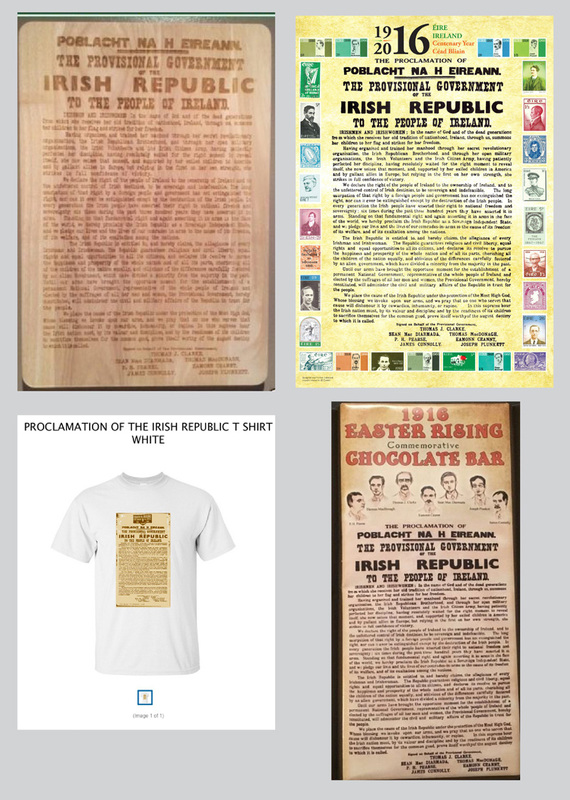 The T shirt, bottom left, is part of the merchandise on sale in the Sinn Fein online shop. Sinn Fein also used the same image in some of its literature in the recent election. This particular leaflet was distributed by Aengus O Snodaigh TD. Original Proclamations can be seen in a number of places in Dublin, including the GPO itself, the National Library and the National Print Museum. The latter has produced a full size facsimile from its own copy of the Proclamation, printed on a Wharfedale press from the same period. It also has more background on how it was typeset and printed. Further discussion about ‘viral versions’ of the Proclamation here. Irish Times diary article on James Mosley’s 2011 ATypI Conference presentation.